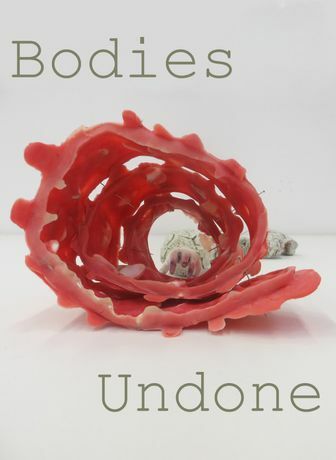 Bodies Undone finds the figure in an unravelled state. This drawing, painting and sculpture show reveals the body broken down with its emotions hanging out. Layering and slicing of information fragments the figures, allowing them to morph between the real and the imagined self/other. Experiences and memories are re-played out in a surreal, altered world. A world caught in a flux of internal and external dialogue. The process of making: painting, drawing, sewing, firing, building and wrapping transforms the internal drives and ideas into an art object. The art object is then re-consumed and internalised by the viewer and artists. This feeds the making of the next piece, where figures may reoccur. In these works there is a process of consuming, digesting, expelling and then re-consuming experiences and memories. Bodies Undone also holds a mirror to the artist external body, which inhabits the skin of the piece. It leaves physical evidence of its activity; imprints upon worn clothes, used cups, body casts, handled clay and paper/canvas. The bodies’ fears, desires, fantasies, obsessions and scars are unpicked and revisited. This unfastening of body parts provides a gaping hole, an orifice into an internal reality… a place to peer and feel.